Model DT862 three phase four wire electromechanical front board installed active energy meter is a kind of new style three phase four wire active energy meter, it is on the basis of original D86 three phase electromechanical meter, and fully absorb new technologies about electromechanical meter from domestic and abroad. 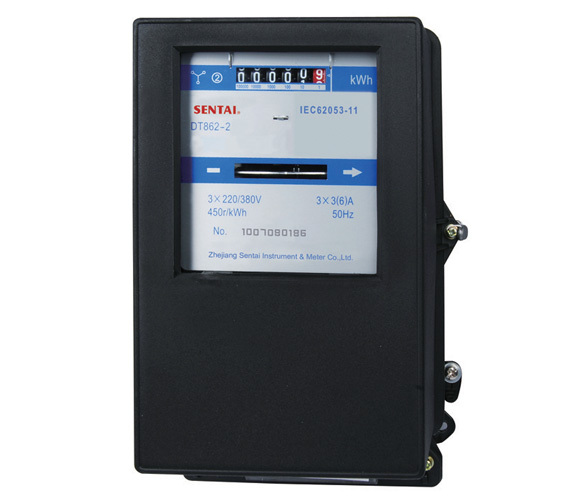 The meter completely accord with relevant technical requirements of class 2 three phase active energy meter stipulated in international standard IEC 62053-11. 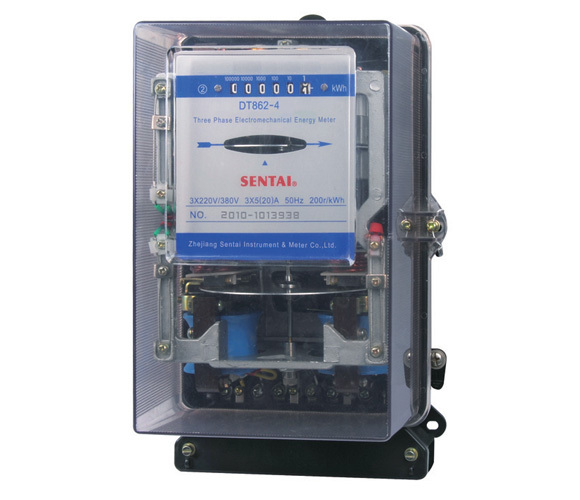 It can accurate and directly measure 50Hz or 60Hz active energy consumption from three phase four wire AC electricity net, it is use for setting indoor or out door meter box. The meter has novel design, rational structure, and it can display total energy consumption by drum wheel mechanical register. It has following features: high overload, power loss, long-life, specious appearance, etc. ● Front board two fixed installation, the cover is made ABS engineering plastics molded overall which has a transparent glass window, the bottom of the meter is made of quality steel which is after double-through antirust processing, and the terminal is made of quality bakelite material which is moisture-resistant, fire-retardant, high temperature molded overall. It has following features: economy benefits, specious appearance, etc. 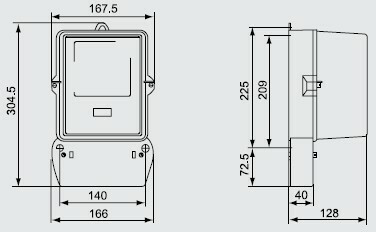 ● The meter frame adopt aluminum molding with excellent mechanical strength, stable structure and anti-impact. ● Voltage components and current components is used of double insulation structure, has good electrical characteristics. ● Standard configuration the meter adopt double gem bearing, oriented bearing is made of lubrication graphite bush and stainless steel needle. It has following features: long-life and minimal friction, etc. May select magnetic thrust bearing. ● All kinds of error adjustment mechanism adopt no step shifting mechanism. The meter starting and creeping needn’t to be adjust which is finished by anti-creeping hole of disc and convenient for adjusting by users. ● Standard configuration 6 digits display by drum wheel mechanical register, may select 7 digits display by drum wheel mechanical register. ● Standard configuration without the device which can prevent retrograde, may select add the function of prevent retrograde. (Please specified when ordering). 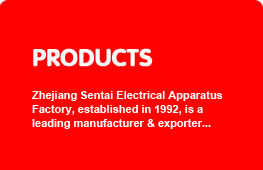 ● Three components measure three phase four wire active energy consumption.